If one walks along 10th Street SW today south of Independence Avenue, it would be hard to know due to the configuration of the street that at either end of the corridor lays the Smithsonian Castle and Banneker Overlook. Elsewhere in Southwest, Maryland Avenue is a disjointed boulevard blocked for the most part by railroad tracks. Empty lots and unused buildings litter the landscape. Freeways and expressways crisscross the area and disrupt the neighborhood urban fabric. These consequences of urban renewal in Southwest will change dramatically over the next few decades if the plans from the recently released National Capital Framework Plan are implemented. On July 10th, the National Capital Planning Commission (NCPC) in conjunction with the U.S. Commission of Fine Arts released the draft plan for a 90-day public review and focuses on four main areas surrounding the National Mall – Southwest Rectangle, Northwest Rectangle, Federal Triangle, and East Potomac Park. The main areas of interest in the Southwest Rectangle redevelopment include 10th Street, Maryland Avenue, redeveloping existing sites with infill development, and restoring the street grid by decking freeways. The draft plan calls for 10th Street Southwest to become a mixed use corridor with shops, residences, offices, restaurants, and a memorial at the intersection of 10th Street and a rebuilt Maryland Avenue – most likely to be the site of the Benjamin Banneker Memorial. The Forrestal Building, home to the Department of Energy, currently straddles 10th Street at Independence Avenue and blocks the view of the Smithsonian Castle. Under the draft plan, the Forrestal Building complex would be redeveloped to allow multiple uses. At the southern end of 10th Street, a new major museum would be built at Banneker Overlook, helping to draw people from the National Mall to the new Southwest Waterfront below via a grand staircase. Here's the current view of 10th Street north towards the Smithsonian Castle. Notice that the Forrestal Building blocks most of the castle from view. Maryland Avenue would be restored between 9th Street and 14th Street by covering the railroad tracks that currently run in the avenue’s right-of-way. As a result, Maryland Avenue would link the U.S. Capitol to the Jefferson Memorial. Under the draft plan, Reservation 113, a patch of land between 9th Street & 7th Street, would become the public space it was meant to be under Pierre L’Enfant’s original plan for Washington. Neighboring Virginia Avenue would be enhanced by creating a slender railroad trestle and enhancements to the VRE station would allow two-way traffic on that rail line. 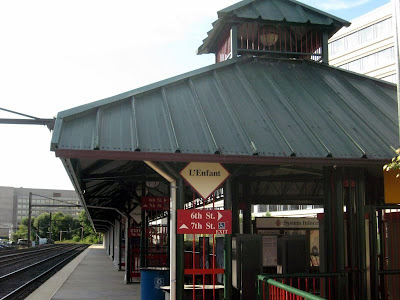 Here's the L'Enfant Plaza VRE Station platform alongside Virginia Avenue. 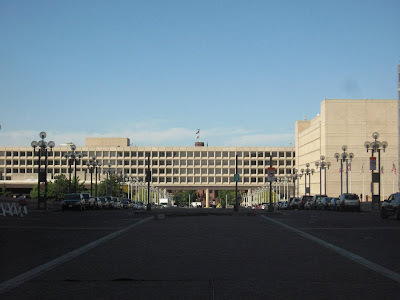 Buildings such as the Liberty Loan Building near the 14th Street Bridge, the Whitten Building at the Department of Agriculture campus, and the unused Arts and Industries building at the National Mall could be redeveloped as museums or other cultural institutions. Other sites scattered around the Southwest Rectangle, including parking lots, vacant land, and decked over portions of I-395 (the Center Leg Freeway) could yield new mixed-use development opportunities. In addition to decking over the Center Leg Freeway near the U.S. Capitol complex, the draft plan calls for decking the Southeast-Southwest Freeway west of 7th Street so F, 9th, 11th, and 12th Streets can be re-established in the neighborhood. The 9th Street tunnel would be decked between Independence Avenue and D Street to re-establish 9th Street. In the long-run, the 14th Street bridges would be rebuilt, with tunnels approaching those bridges. A copy of the National Capital Framework Plan is available on the NCPC website. The public review and comment period for the draft plan will extend until October 10, 2008. I just wanted you to know that I am reading your blog and appreciate the coverage of SW. I live on G Street and am excited about the changes coming our way! I'm glad to know I have some readers out there! i just found your blog as well. thanks for covering your part of town so the rest of us can learn about southwest! Women's Museum Coming to Mall?